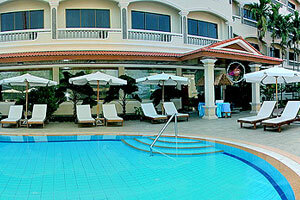 Khemara Angkor Hotel is only a mile equidistant from Siem Reap Airport, and from the downtown area of Siem Reap. 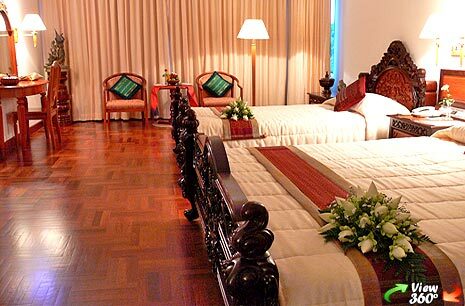 All 130 rooms at this four-star hotel are spacious yet intimate, with polished marble complementing the earthy beauty of rich tropical hardwoods to capture an atmosphere of timeless, classic Khmer style, artfully blended with contemporary trends. 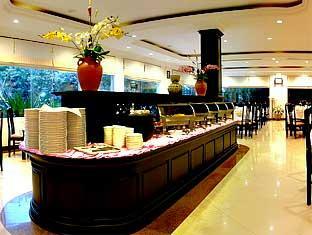 This hotel boasts superior recreational and leisure facilities including sauna, massage, outdoor pool, and fitness center. This convenient property is a good choice for getting to the surrounding golf courses and for doing your sightseeing tours to the Siem Reap area, especially the temples at Angkor Wat. The famous ‘Pub Street’ and ‘Angkor Night Market’ are well worth the short tuk-tuk ride to get there for a little slumming and shopping during the balmy evenings. 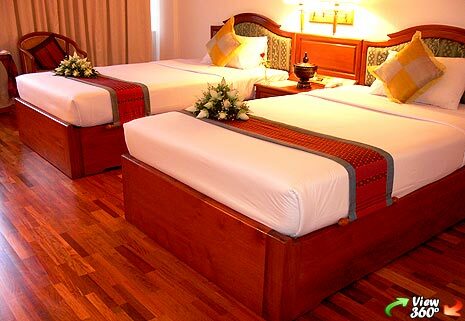 You will find that this hotel has their front desk staffed round the clock to attend to your needs night and day, and the rooms are large, clean, and comfortably appointed, echoing traditional Khmer decor. Wi-Fi Internet connectivity is provided free in all the rooms so you can stay in touch as you need to and plan other aspects of your trip. Breakfast is a sumptuous spread offering something for every appetite, and the variety and quality is extended to the other meals as well. Ask the staff for a box lunch or breakfast if you plan to be out all day and they will gladly comply with a tasty filling breakfast and/or lunch for you. When you exit the front door of the hotel, if you walk to your right you will find a couple of local barbecue vendors that will let you immerse your taste buds in real local food. As for amenities, the spa is discounted for guests of the hotel and the swimming pool is very relaxing and seldom crowded. If you like to workout when you are traveling, you will appreciate their gym on the premises. After a long day of fairways and greens, unwind in the spa with a very professional and traditional Khmer massage.